After Yogi Adityanath came to power in Uttar Pradesh, he started implementing a host of developmental schemes, for the overall progress of the people and the region. But improper monitoring has caused these schemes to produce unsatisfactory results. Now, the state government will launch a new internship scheme that will select educated youngsters and post them as Lok Kalyan Mitras. The name of this project is Lok Kalyan Mitra Internship Program and selected applicants will have the responsibility to look after scheme implementation in each block. Developmental schemes, implemented by state will only become successful if they are monitored properly. The task of the Lok Kalyan Mitra Interns will be to offer scheme related details to the commoners, and carry their feedback to the respective authorities. It will ensure proper implementation of schemes. 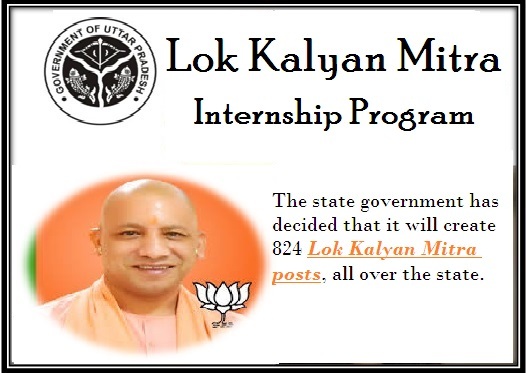 Salary for Lok Kalyan Mitras – All interns, posted in the blocks will receive a monthly salary of Rs. 30000. There actual salary will be Rs. 25,000 and will be topped off with an allowance of Rs. 5000. The interns posted at the state level will receive a salary between Rs. 35,000 to Rs. 40,000. The actual remuneration will be Rs. 35,000 while an additional of Rs. 5000 will be offered as allowance. Total number of posts – The state government has decided that it will create 824 Lok Kalyan Mitra posts, all over the state. Lok Kalyan Mitra posts in blocks – There are 822 blocks in UP. Each block will be placed under the jurisdiction of one Lok Kalyan Mitra. Thus, 822 block level Lok Kalyan Mitra posts will be created. State level Lok Kalyan Mitra posts – Apart from these, two individuals will be posted at the state level. These two state-level Lok Kalyan Mitras will coordinate with block level interns. Reservation for female candidates – Yogi Government has also mentioned that out of the total seats, 30% will be reserved for interested and eligible female candidates. This comes to a total of 247 Lok Kalyan Mitra posts. Written examination – All interested applicants will have to sit for a written examination. Only the applicants who score high marks in this test will be selected to fill in the posts. Tenure of internship – Each intern will serve at the post for a term of one year. The program offers the job on a contractual basis only. Option of renewal – In case the applicant is interested in serving as a Lok Kalyan Mitra after his/her one year term is over, he/she will have to apply for a renewal. Selection of candidates – All candidates who pass the written test will then be scrutinized by a panel of high placed government officials, for final selection. The board will consist of senior officers, development officers and information department’s representatives. Resident of the state – This program is only open for those people who are legal residents of Uttar Pradesh. You may apply for this written examination only if you possess residential certificates, issued by state government of UP. Age related criterion – The lower age limit of applicants is 21 years while the upper limit is 40 years. All candidates, falling in this age category can apply only if they have proper age certificates. Educational qualification – Only graduates from science, arts or medical fields will be able to apply for filling in these posts. Due to this, candidates have to attach their college passing certificates for verification. Well-versed with handling social platforms – Each applicant must have adequate knowledge about handling social media platforms. Without at least 2 years’ experience, applicants will not be selected for the test. Necessary qualification papers must be submitted for verification. Aadhar card – Last by not the least, candidates need to offer adequate documents to support their identification claims. For this, Aadhar card is a must. Any applicant who does not have the Aadhar card will not be able to apply. How to attain registration form and apply for the project? Only online application process has been highlighted by the state government. The online registration process has not begun. As soon as the state government makes any official announcement and launches the scheme portal, we will offer the details accordingly. To get the digitized application form, applicants will have to log in on the official website. The CM has already mentioned that the authority is working hard to launch the UP Lok Kalyan Mitra Application form 2018 site as soon as possible. Applicants will be able to get access to the online registration form from this page itself. Any wrong information in the application form will lead to its cancellation. To keep this at bay, applicants must recheck the details, entered in the online form. The actual step-by-step enrollment process is still under the wraps. Applicants will have to pay a certain fee for making the enrollment. This payment needs to be done online. Candidates need to collect a print out of the online application fee payment and the enrollment form. By appointing these individuals, UP government will be able to ensure that schemes are being implemented in proper fashion and commoners are getting the benefits. Apart from this, state representatives will also acquire important feedback from the people that will assist respective departments to bring about changes in the schemes.